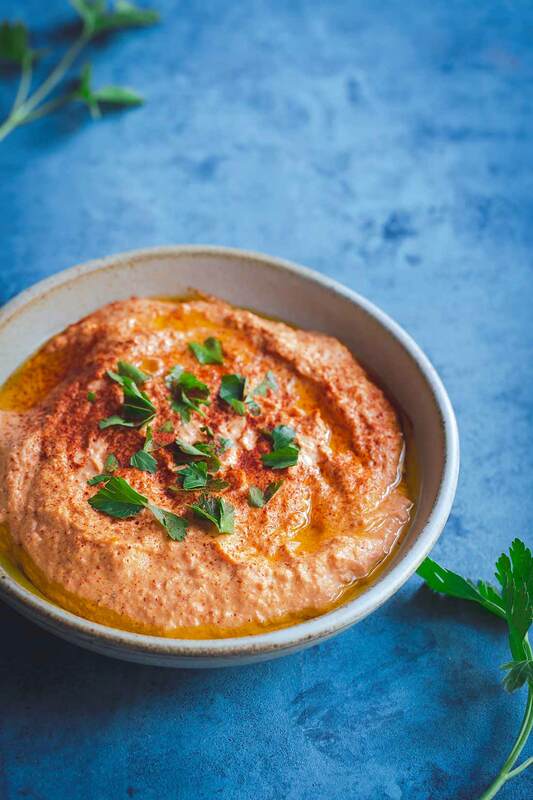 Want to learn how to make smokey roasted red pepper hummus? You won’t believe how easy it is to make, and it tastes so much better than pre-packaged versions! 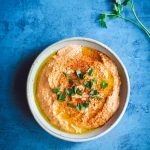 This incredibly smooth, creamy hummus recipe can be prepared using either jarred or homemade roasted red peppers. Last week, we covered how to roast red peppers. Now it’s time to use them! 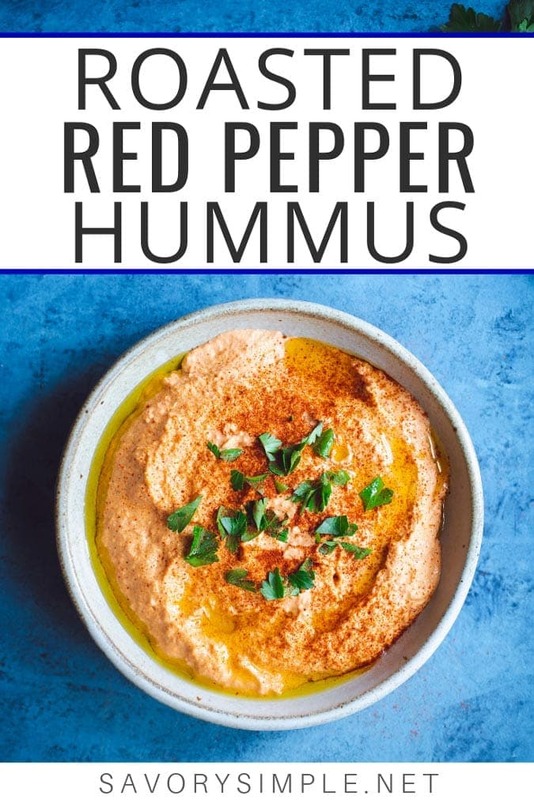 This roasted red pepper hummus is incredibly satisfying as both a healthy snack and a condiment that works great on sandwiches and wraps. It has a wonderful smokiness from both the roasted peppers and smoked paprika, which was a spontaneous last minute addition that I’m so happy I tried. As I’ve previously noted, I’m not a fan of most pre-packaged hummus brands (with one recently discovered exception; The Perfect Pita hummus, which I tried on a friend’s recommendation. It actually tastes homemade. However, I have no idea if it’s available nationally). I love the control over flavors that I get making homemade hummus. It allows me to create a perfect flavor balance, making sure the salt and acidity levels are exactly where I want them to be. You don’t get that flexibility with store versions. Some of these tips will sound familiar if you’ve already tried my classic hummus recipe. Always use fresh-squeezed lemon juice as opposed to the bottled version. Those don’t taste right. You can mince the garlic with a knife (I usually do), but if you really want to infuse the flavor into the hummus, try grating the clove on a microplane zester. This releases the juices from the garlic and creates more of a paste. If it seems like the hummus is bland or “needs something” at the end, try adding a bit more salt or lemon juice. Salt and acidity usually brighten up the flavors in any recipe that is lacking. Add slowly; it’s easier to add than subtract (my kitchen mantra). While this recipe can be prepared using jarred red peppers, I’m a big fan of roasting them myself when I have the time. It’s very easy and much more economical. Even more importantly, roasted red peppers have a much smokier, fuller flavor. Learn how to roast red peppers using my step-by-step tutorial. Tahini is a Middle Eastern paste made from ground sesame seeds, and it’s one of my favorite ingredients! It’s actually easy to make homemade tahini, though to be honest, I don’t usually bother since most of the jarred versions are so good. 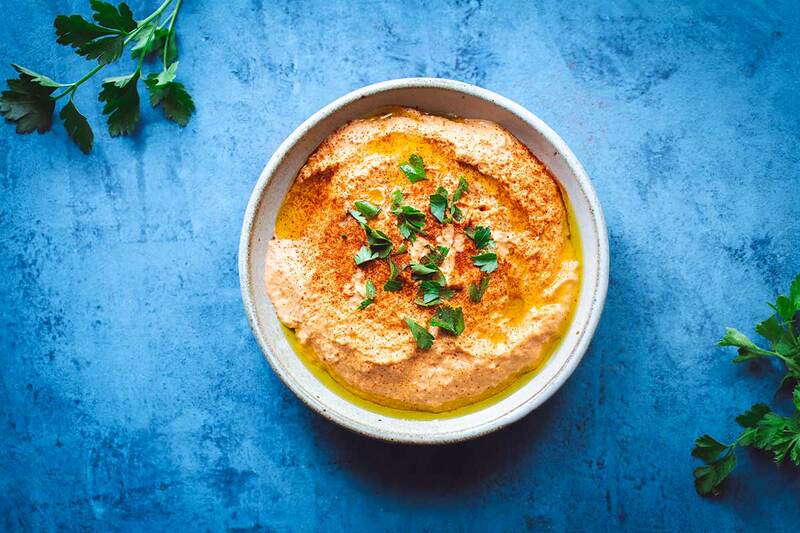 When using tahini in hummus or any recipe, it’s important to note that the thickness can vary quite a bit between brands, and it needs to be very well-stirred before using. 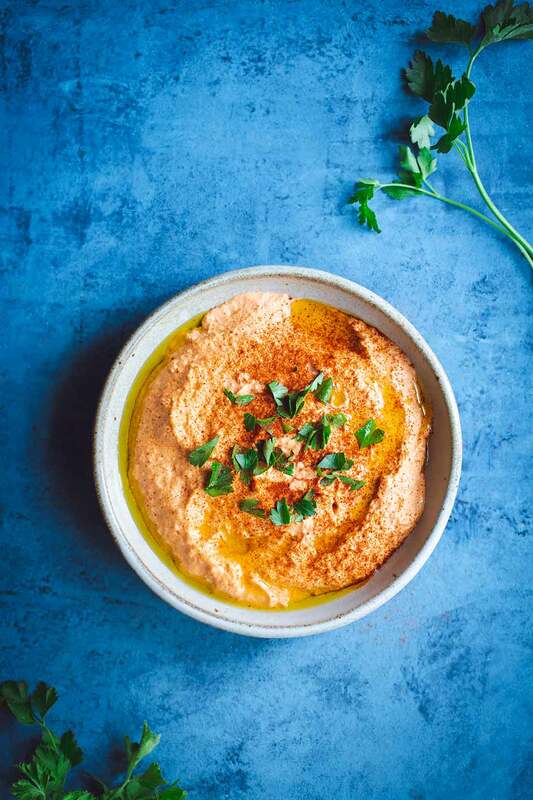 If your tahini is very thick, you may want to add a couple tablespoons of oil or water to your hummus to reach the desired consistency. For more ideas, Taste of Home has an excellent roundup of different ways to use hummus. How Long Does Homemade Hummus Keep? Homemade hummus will keep in an airtight container in the refrigerator for up to 5 days. You can also freeze it for up to 6 months, then thaw in the refrigerator overnight before serving. If you like this dip recipe, you should also check out my Hot Crab Dip, Salsa Verde and Buffalo Chicken Dip. 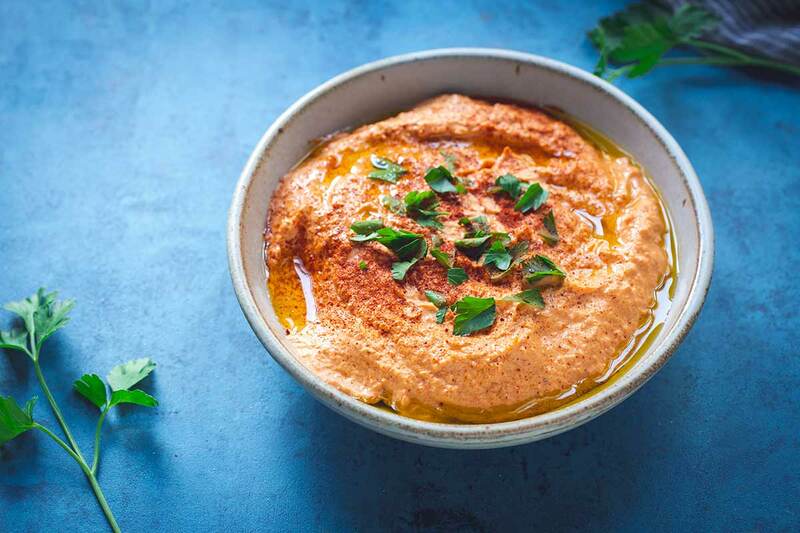 This roasted red pepper hummus is bursting with flavor and easy to prepare at home! Roasted red peppers and smoked paprika add a nice smokiness. Drain the beans (no need to rinse). If using chickpeas, I recommend taking the time to peel them and discard the skins. While not a necessary step, this creates an incredibly smooth hummus. If using jarred red peppers, drain and pat dry with paper towels to remove some of the excess liquid. Add the beans and red peppers to a food processor, pulsing several times to start breaking down the ingredients. Add the garlic, tahini, olive oil, lemon juice, salt, and 1 tablespoon water. Puree until the mixture is smooth, stopping to scrape down the sides of the bowl a few times along the way. Stop and check the consistency. If you’d prefer a thinner hummus, add an additional 1-3 tablespoons of water and puree until the desired texture is reached. Taste, and adjust the seasoning if desired. Place in a serving bowl and sift a thin layer of smoked paprika on top (about 1/4 - 1/2 teaspoon), then garnish with chopped parsley, if using (see notes on how to add smoked paprika directly to the hummus, if you prefer). Leftovers will keep in the refrigerator for up to 5 days. If you're using chickpeas and want an incredibly smooth hummus, take the time to peel off and discard the skins (or as many of them as you have the patience to remove). While white beans aren't the traditional choice for hummus, I find they create a nice, smooth texture without the need to peel, so I often use them instead. If using jarred red peppers, this recipe calls for approximately 1 (12-ounce) jar. If using homemade roasted red peppers, the quantity will depend on how large they are. One cup will be approximately 2-3 medium peppers. In addition to adding a wonderful smoky flavor, smoked paprika adds a beautiful color for presentation. I prefer to sift a thin layer over the hummus since it looks nice, but you can also add it directly to the hummus. After pureeing the ingredients in the food processor and making all of the necessary adjustments for taste and texture, puree in the smoked paprika, 1/4 teaspoon at a time, until you’re happy with the flavors. Please read my full post for additional recipe notes, tips, and serving suggestions! For help troubleshooting a recipe, please email [email protected] I’ll try to respond to urgent questions as quickly as possible! This email address is only for recipe troubleshooting; Solicitations will be ignored. Jennifer graduated from the Culinary Arts program at L’Academie de Cuisine, and has worked professionally as a line cook, pastry chef, and cooking instructor. She's written a weekly column for The Washington Post Food section, and her cookbook, The Gourmet Kitchen, was published in 2016 by Simon & Schuster. Sign up for my FREE email course: Simple Recipes for Busy Lives! Learn how to get dinner on the table even when it feels like there's no time. Smoked paprika is such a perfect addition to the smokiness of the peppers! Smoked paprika is one of my favorite spices but I’ve never tried it in hummus before! Love it! Great recipe. This is so good, I could could sit and eat the whole batch! Join my Facebook Group for recipe troubleshooting, kitchen tips, and more! Want Fast & Easy Recipes? Sign up for my FREE email course! I'll teach you how to get dinner on the table in no time. SUBSCRIBE & RECEIVE A FREE EBOOK WITH MY 25 FAVORITE RECIPES!